La Sophistication Et Simplicité En Provence. Friday morning is the perfect time for some pure unadulterated escapism. And Alina and Gregoire’s wedding brings you exactly that. Ice cold polar winds?? Pas ici sur Rock My Wedding mes amis…we’re off to Provence. Alina The Bride: Some say Paris is the most romantic place in the world, but we think Provence could rival it for this title. The cutest little villages and breathtaking views, the vineyards and olive trees, delicious cuisine and wonderful wines, lavender and sunshine – you cannot help falling in love with this region. And nested in the heart of Provence is Mas de la Rose. As soon as we entered the gates for the first time, we fell in love with the place: it just oozes charm and the design of the place is sheer perfection, every little detail is thought through so well and it flawlessly combines the essence of Provence with modern style. I’ve spent countless hours on Pinterest looking for hairstyles and makeup, but I always came back to the soft low bun and natural make up with accent on the eyes. Axelle and Blandine did a wonderful job at creating the look I was hoping for and I had great fun working with them. For the hands, I originally wanted to have French manicure, being so classic for a bride, but in the end went with the suggestion of the artist at Nails Inc. to have my nails painted with an off-white 3 week gel colour. I have always looked at Pronovias dresses with admiration and as soon as Gregoire proposed, I knew where to go! I always dreamed of an A-line dress and was convinced that a fishtail one would not suit me. However, when Gregoire mentioned that he prefers the mermaid style, I decided to give it a try and fell in love with it. Everyone at Pronovias were sending me off to get married like I was their family, especially Sanda who helped me find my dress and knew straight away that I was going to love it. Gregoire wore a navy tuxedo from Armani, he knew that he didn’t want to be in a black outfit in South of France, but wasn’t sure what style to go for. But when he tried his Armani tux, it fitted him like a glove and we knew it was the one! I got my shoes at Dune as I wanted them to be pretty, comfortable and not too expensive – they turned out great, I spent the whole day in them and they even carried me through all the dancing. 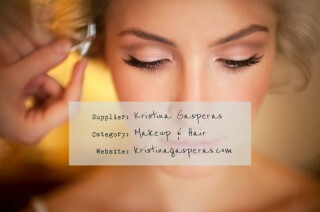 For the hair, I had a hairband and a comb to give a finished look for my bun; both of them are from Pronovias. I thought at first that both of them would be too much, but in the end you couldn’t see them at the same time. As we only had 4 months from the proposal to the D-day, we decided that bridesmaid dresses and groomsmen outfits are not something we would like to concentrate on. However two of my best friends asked me for the colour scheme of the wedding to make sure their dresses went nicely with it and it turned out perfectly: the dresses were very different, but looked really good together. Our venue was so beautiful, that we didn’t think we could add a lot to it. So I got a few little details that I found very cute: the personalised wedding hanger that I bought from Clouds and Currents at notonthehighstreet.com, the finger print tree and a very romantic cake topper that I bought from Confetti. 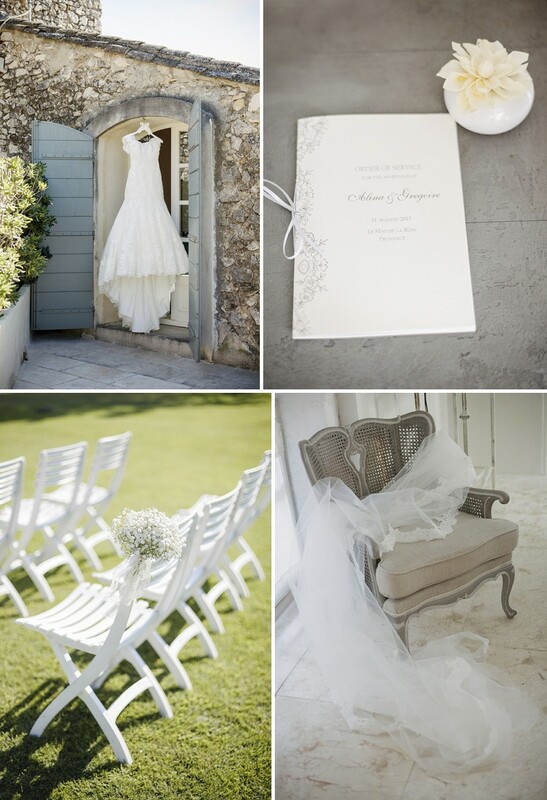 In terms of colour scheme, we wanted pastel and neutral colours that would complement the Provençal decor. I was looking for a florist for a long time scouting through numerous blogs and finally I found Blandine at Atouts Fleurs. She did such a wonderful job and she really cares and loves what she is doing. We had all the bridal classics: the white and pink roses, the round bridal bouquet, the cute pew ends and the wreath table centerpieces with a candle in the middle. Instead of a floral arch at the end of the aisle, we had two iron cast vases with cone shaped arrangements and for the table plan our florist created a beautiful tray made out of pink carnations, one for each name card. We spent a long time looking for music, as we wanted something quite modern, yet not cheesy, and of course the lyrics had to match the occasion. We chose Bruno Mars “Marry Me” as the signal for guests to take their seats, Des’ree “Kissing You” as it’s just so romantic and still gives me shivers; Sade “By your side” for the signing of the wedding certificate and Imagine Dragons “I am on top of the world” for the exit as it couldn’t describe better out feelings at that moment. For the readings, we wanted to include the languages of our wedding, the Russian, English and French, so we had one reading in each one of them. The English reading from “The Irrational Season” by Madeleine L’Engle was my favourite, it so different to anything I’ve heard before and wise! Key entertainment during our reception were the speeches, I think we had 9 of them. The main challenge for us was to make sure that no guest felt left out as not everyone spoke fluent English. As a result, we have asked all the speakers to submit their texts in advance, so they could be translated into the other two languages. Then we ran all of them in English, French and Russian on a large screen while a person was speaking. What a UN conference! I always wanted a three tier cake that we could cut at the end, but we didn’t want a traditional iced cake as not a lot of people actually enjoy eating them. So we worked with a great patisserie Hawecker who created our beautiful praline and chocolate mousse cake topped with fresh fruits. Many guests commented on how delicious it was! We also had a selection of petit fours that lasted through the after party and we had a lot of fun tasting all the different flavours. Haweckers also prepared our guest favours, which contained classical treats: macaroons, madeleines and calissons (a traditional almond sweet from the region). The menu was very French as well, who doesn’t love their beautiful cuisine! The food was prepared le Potager du Mas, the restaurant at le Mas de la Rose, and it was so yummy: scallops as a starter, followed by sea bass or veal as chosen by the guests. We bought a lot of our décor and stationery at Not On The High Street as they have such a choice of creative small business that design the cutest things. Our wedding signs, e.g. “Welcome to Our Wedding” was provided by Made With Love Designs Ltd. Our ceremony booklets, place cards and guest book were provided by Beautiful Day. We did our table numbers ourselves, we asked our parents to send us childhood pictures and then we selected the ones where we were the same age, combined them in Photoshop together with the age as a table number, printed and put them in picture frames. As a result of this fun exercise we had many more childhood photos that we wanted to share with the guests so we made a whole photo album showing how we were growing up, I think the guests had a great deal of fun laughing at our looks throughout the years. In hindsight I would have hired a wedding planner to manage the wedding day to take any stress and organisational questions off our shoulders, it would also help to avoid a number of hiccups that we experienced. Also at the last moment, and this was already a pretty last moment wedding, we decided to enlist a videographer. I would say it is definitely worth it, it complements the wedding photos, captures emotions and moments like nothing else and gives you another chance to relive the day. And lastly, our ceremony and cocktail were hosted in the grass, so we bought heel toppers for all our female guests, which we placed at the entrance and saved me and the ladies from sinking into the grass. All of our suppliers really did a wonderful job and helped the day to come together. How beautiful does Le Mas De La Rose look? Literally the ultimate in French sophistication. Perfect for the stylish Alina and Gregoire. I love that the thoughtful pair made sure every language was catered for too.